The Sheraton Hotel and Conference Centre, Buenos Aires Argentina was the venue for the 29th International Congress of Radiology (21-24 Sep2016) organised by the International Society of Radiology a society founded in 1925 for the promotion of radiology knowledge and teaching worldwide. Over one hundred invited speakers from 24 countries delivered invited talks in addition to proferred papers and posters and an exhibition which was attended by several thousand delegates. Buenos Aires , often considered the ‘Paris’ of Latin America was a wonderful venue for an international conference. The city with its magnificient boulevards ( avenue Julio 9 is one of the widest boulevards in the world), beautiful parks, statues, a mixture of architecture old including the Casa Rosada (with European influences) and new skyscrapers, museums, bookshops galore , shopping galleries and a famous opera house ‘The Teatro Colon’ as well as traditional tango houses and a recently developed dockland area provide the visitor with much to explore. 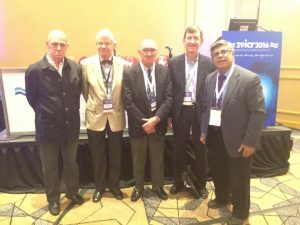 A wide range of radiology topics were covered during the conference including a session on the history of radiology organised with the International Society for the History of Radiology (ISHRAD). In Mexico the news of Roentgen’s discovery arrived in 1896. Famous early pioneers included Dr Tobias Nunez in Jarez Hospital Mexico City. In Nov 1896 at the 2nd PanAmerican congress Dr Pepper delivered 4 lecture on radiology. In 1905 one of the earliest Xray equipments were purchased but progress was halted in the next decade during the Mexican Revolution. The first Mexican society was the Mexican electroradiology society in 1926 with a book and journal published that year. The Mexican Radiology and Imaging Society was started in 1946. Pioneering studies on angiography were performed by Celis and Gomez del Carpo in the 1940’s. In 2016 Mexico had 6500 radiologists for a population of 112 million with 50 training centres. Dr A Wozniack delivered the next talk on ‘The History of Radiology in Uruguay’. In 1899 and 1900 the first PHD theses and scientific papers on radiology were published. The society of Radiology was first founded in 1925 and refounded in 1984. Perhaps the most famous name in radiology from Uruguay is Raul Leborgne famous for his work on mammography and analysis of calcifications on mammograms. The news of Roentgen’s discovery reached Colombia in 1896. The first X-ray machine was installed in Bogota in 1911. In 1950 the Colombian Society of Radiology was formed. Interventional radiology started in 1977, CT scanning in 1978, ultrasound in 1979 and MRI in 1990. The Colombian Radiology Journal started up in 1988. Dr M Freson from Belgium then delivered the talk on ‘Historical Review of Brazilian Radiology’ co authored with R Van Tiggelin from Belgium. An early pioneer in Brazil included Silva Ramos who received news of Rontgen’s discovery in 1896. In 1897 the first radiology room opened in Rio de Janeiro. In 1899 De Carvalho opened the first radiology department in Sao Paulo. In 1904 the first radiology course was held in Bahia. In 1913 the first Professor of Radiology in Brazil was appointed. In 1936 De Abreu was doing pioneering work on Roentgenfluorography. In 1976 the first CT Scan was installed in Sao Paulo. Argentinian contributions covered included those of Carlos Heuser (1868-1934) who founded the Argentinian Society of Radiology in 1917. Early contributions included studies on HSG with lipiodol in 1922, venography in 1919. The contributions of Carelli 1882-1963 include pneumoretroperitoneum imaging in 1921. Contributions of the neurosurgeon Balado to ventriculography and of course Mirizzi and his syndrome and contributions to operative cholangiography were presented. It was also nice to hear about the camelotte sign ( named after a plant in Latin America) better known as the water-lilly sign in Europe in patients with hydatid cysts. In this session he gave personal examples of how radiology investigations had changed in his working life and illustrated the talk with personal examples eg of early translumbar aortography performed in the early days of radiology before being replaced by Seldinger catheter angiography. Many of the old techniques had been replaced by newer safer and more comfortable techniques for the patient. The contributions of this pioneering British radiologist from Liverpool and his association with early orthopaedic radiology were presented. In 1925 he organised and was President of the First Congress of the International Society of Radiology held in London. The delegates have grown from a few hundred in the early days to thousands 29 congresses later! The First American Xray Journal was founded in 1900 by Dr Roberts. The ARRS strted in 1901 as the Eastern Rontgen Society AJR starting up in 1913. The organisation was involved in training radiographers in World War 1. The American Boards were started in 1934. The RSNA started as the Western Roentgen Society in 1914 and met in Chicago in 1915 with Miles B. Titterington, Gray C. Briggs, and Fred S. O’Hara, Edwin C. Ernst, as the founders, and became the RSNA in 1916. It continues to meet in Chicago to this day. 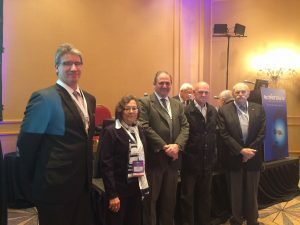 Great focus on research and education has continued over the years with the RSNA heavily involved in research and worldwide educational initiatives. The contributions of some of the early pioneers including Lord Rayleigh , Karl Dussik, Doug Howry etc were discussed to set the scene. Donald who studied medicine at St Thomas’s Hospital in London ended up as a Professor of Midwifery (OB/GYN) in Glasgow. It was there with Tom Brown his collaborator that he did his pioneering work on ultrasound resulting in his classic paper in the Lancet in 1958 ‘Investigation of abdominal masses by pulsed ultrasound’. Ultrasound has been applied in many clinical settings since including of course obstetrics and has benefited millions of patients worldwide since the pioneering work of Ian Donald. The final talk was delivered by M Freson ‘Rontgentherapy and other ionising radiation treatment techniques’ co written with R Van Tiggelen. H Danlos and Despeignes are credited as being the pioneers of radiotherapy in France. Freund in Vienna irradiated hairy naevi in the hope of curing them. In 1899 Sjogren performed the first proven cure for cancer using Xrays. In 1913 the Coolidge tube was a major advancement and then of course the linear accelerator first installed at the Hammersmith Hospital, London in 1953 opened up the way for modern radiotherapy. The sessions were enthusiastically received and were a great success. Thanks must go to to Prof A Buzzi from Argentina and his team for organising this successful session at the ICR and we hope that future ICR meetings will carry on these history sessions .